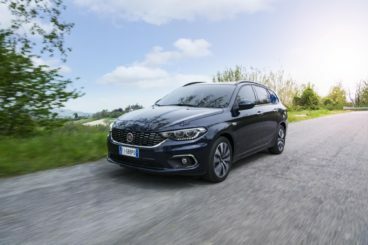 The new Fiat Tipo Station Wagon marks Fiat’s return to Estate cars for the first time in almost ten years. It’s essentially a five-door, larger, more practical version of the standard Tipo, with Fiat possibly offering a four-door saloon variant at some point in Britain, too. More of a stretched Hatchback than a purpose-built Estate, the car is comfortable, spacious and boasts a 550-litre boot as well as some pretty efficient engines. Find out more about the history of Fiat by reading our article here. OSV takes a closer look at what it’s all about with our 2018 Fiat Tipo Station Wagon review. The Tipo Station Wagon is very far removed from classical Italian cars of yore that were a dream to handle. This one is Italian in name only, with its performance on the road distinctly ordinary. That’s not such a bad thing – indeed, buyers looking at this type of car will surely love the fact that Fiat have focused on comfort. 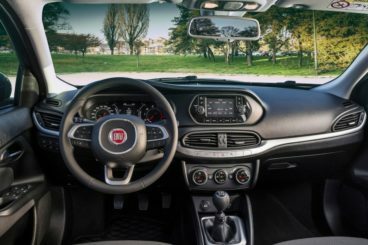 Moreover, Fiat have worked hard to give the steering a bit more feel so that keener drivers won’t feel alienated from the experience. It’s never going to be as fun as, say, a Focus Estate, but its light steering means that it’s at least easy to drive in the towns and cities. Body roll is kept to a minimum, while variable-rate dampers come as standard. These adapt depending upon conditions and speed, but the car always feels overly soft on poorer surfaces. In terms of its engines, there are three petrols to choose from. A non-turbo 1.4-litre unit kicks things off with its modest output of 94bhp and its 128Nm of torque. That doesn’t sound like a lot, and there’ll be a lot of revving involved. It has a 0-62 time of 12.3 seconds. Next in line is a 1.6-litre petrol engine that comes paired up with a 6-speed automatic gearbox. It produces 108bhp and can whizz you from a standstill to 62mph in a respectable 11.6 seconds. Topping the range is a rather brisk, turbocharged 1.4-litre engine that develops 118bhp. It’s mated to a 6-speed manual transmission that demands a lot of work, and it has a 0-62 time of less than 10.0 seconds. It’s fairly economical too and can return around 46.9mpg on a good day. The original Tipo boasted a futuristic dashboard that had a minimalist design ethos to it. Fast forward to 2018, and this Station Wagon variant is distinctly plain Jane. That said, it’s all sensibly laid out and easy to use, and for many buyers, this is all they’ll need to hear. The clear instrumentation is a plus and the brands uConnect multimedia system is an asset to the higher-spec models (although the 5” version is a bit on the small side). There’s a good amount of adjustability available for both the steering wheel and driver’s seat, and drivers should be able to find the perfect position without much hassle. Overall, the cabin lacks the quality of a Volkswagen but it isn’t too shabby at all. For this price, it’s very liveable. Is the Fiat Tipo Station Wagon practical? Its 550-litre boot is certainly a huge bonus, although there are rivals in this sector who can offer even bigger boots. Fiat will confirm exactly how much load space there’ll be when the rear seats are folded soon, but all models come with a useful variable-height floor. Those sat in the rear will find that headroom is a bit limited. This is thanks to the fact that the rear bench is much more elevated than the front seats. Anyone who’s a little taller than usual will find themselves brushing the roof. The middle seat, meanwhile, is overly firm and narrow, and anyone sat here will get a raw deal. Are Fiats reliable? Read our unbiased assessment here. Standard kit is fine for all models, with the entry-level model getting the likes of a digital radio, Bluetooth, LED daytime running lights, front fog lights, and remote central locking. The mid-range model gets 16” alloys, the brands uConnect infotainment system, rear parking sensors and cruise control, while the range-topping model rounds things off with a sat-nav, automatic lights and wipers, bigger alloys, a reversing camera and more chrome. Safety-wise? The Station Wagon hasn’t been tested yet but the Hatchback version was only awarded 3/5 when it was crash tested by Euro NCAP. The car’s standard safety kit includes anti-lock brakes, ISOFIX child seat mount points and electronic stability control. If you add autonomous emergency braking for £250, the cars safety rating jumps up to 4/5. If you overlook the entry-level model, your standard safety kit will also include cruise control and automatic lights and wipers. Safety kit is a bit sparse on the whole and it’s hard to understand why Fiat didn’t just include autonomous emergency braking as standard. In terms of its running costs, all the petrols return sub 50mpg economy, which is pretty disappointing. The 1.4-litre 94bhp petrol engine is the most frugal with its returns of 49.6mpg, while its emissions are as high as 132g/km of CO2. The bigger 118bhp variant of the same engine struggles to return more than 46.9mpg on a regular basis, while the 1.6-litre 108bhp petrol averages 44.8mpg economy and emits almost 150g/km. This means it costs £145 a year to tax. The diesels are much cheaper to run. Spacious, very cheap and very well equipped, the basic Tipo SW is one of the best value cars on the market today. All models are superbly equipped, with the mid-range trim our favourite. It gets the brand’s impressive uConnect system, as well as rear parking sensors, cruise control and more. It’s not the biggest in its class, but 550-litres with all the seats up will suffice for most buyers. The cabin feels dated and lacks flair. With no petrols able to return even 50mpg, the car disappoints on this front. Let’s see how the car fares against its rivals in the comparison section of our 2018 Fiat Tipo Station Wagon review. The new Kia Cee’d Sports Wagon is a compact estate car that’s practical, well put together – and which comes with Kia’s impressive seven-year warranty. On the road, the Cee’d Sports Wagon offers the kind of relaxing and comfortable driving experience that buyers love in cars like this. It’s not really sporty – it’s comfier instead! It’s easy to drive too, and although it’s far from being the most powerful in its class, its engines are quiet and smooth. All of them come with the brand’s adjustable FlexSteer system, which lets you make the car’s steering heavier or lighter. The heavier it is, the more secure it feels on winding roads. In terms of its engines, a 1.4-litre petrol unit might be a tad on the slow side for some, taking as it does 12.6 seconds to complete the 0-62 dash. A 1.0-litre turbo petrol makes more sense; it develops 118bhp, which is enough to cover the same dash in 11.0 seconds. However, both petrols – unlike the diesels – lack low down power. Moreover, the diesels are cheaper to run, too. What’s the fuel consumption damage for the petrols? Whereas the diesels can return well over 70mpg, the petrols can’t return more than 47.1mpg, which won’t suit higher mileage drivers. However, a seven-year warranty will soften the blow for some, while even the most expensive Cee’d Sports Wagon sits in insurance group 15 out of 50 at the most. Inside, the Kia is stuffed with standard kit and has a big car feel – provided you avoid the entry-level model. Insulation is a bit of an issue, though, while the car hardly has an eye-catching design. It’s conservative stuff, but that won’t be a bad thing in some buyers’ eyes. 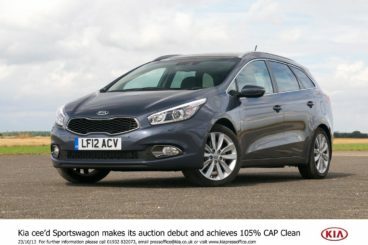 Is the Kia Cee’d Sport Wagon practical? Its boot is certainly impressive, and with all the seats up it measures 528-litres. Fold the rear seats and it can extend to as much as 1,642-litres. Folding the rear seats is by no means an easy operation, though, but the car comes with a retractable load cover. Other than that, the cabin is awash with interior space. Four adults have enough space to sit in relative comfort and there are storage spaces here, there and everywhere. The new Skoda Octavia Estate boasts a massive boot, lots and lots of space, and it’s also fairly cheap to buy and run. It’s not exactly what you’d call entertaining to drive, but the Octavia can offer a relaxed, easygoing driving experience that rivals the Fiat. It’s quiet and – if you pick the right engine – fairly smooth, too. In many ways, it drives a lot like the Octavia Hatchback, which means it’s highly capable – if a bit boring. It feels safe and secure, offers lots of grip and works well in the towns and cities, as well as out on the open road. Adaptive damping is optional, but the car is just fine without it but an optional DSG automatic transmission might be worth specifying if fuel consumption is a concern of yours. In terms of its engines, a 1.0-litre TSI petrol sits at the bottom of the range. It does 0-62 in 10.0 seconds flat and is a very satisfactory, responsive engine. A 1.5-litre petrol benefits from cylinder deactivation tech to keep costs down, develops 148bhp and can get you from a standstill to 62mph in 8.0 seconds while providing plenty of punch. Sitting at the top of the range is the vRS model that whizzes you from rest to 62mph in just 6.9 seconds. Running costs? The 1.0-litre unit is good for a very impressive 58.9mpg, while the 1.5-litre petrol manages returns of 56.5mpg economy while emitting 115g/km of CO2. The vRS model, meanwhile, returns 44.8mpg at best. Overall, this makes the Octavia much more cost effective than the Fiat. Inside, the Skoda’s cabin is well built, comfortable and very roomy. Bigger alloys diminish ride quality a bit, while wider tyres ruin insulation. The dashboard is neatly assembled and clearly laid out, while most of the surfaces feel soft to the touch. There’s more quality overall than in the Fiat, although both cars aren’t as premium-feeling as a Volkswagen. 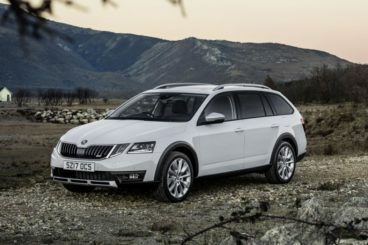 Is the Skoda Octavia Estate practical? The height adjustable seat makes it easy for you to find the perfect driving position, but it’s the 610-litre boot that’s the centrepiece here. That said, it’s still knocked into touch by the Peugeot 308 SW’s 680-litre boot. Still, 610-litres is impressive and the Octavia is a very good all-rounder. Its boot comes with a false floor and a 12v socket, while five people can easily sit in comfort on longer trips. Head and legroom are good and there are plenty of cubbies here and there. Fiat is back in the Estate car market after 10 years, and this is a good effort. A five-door, longer bodied version of the Tipo Hatchback, it’s comfortable, roomy, smart and well-packaged. A 550-litre boot is a highlight, as are split and folding rear seats and good ride quality. The new Fiat Tipo Station Wagon is affordable, well appointed and very effective.